Wednesday Oct 16 – Rob Wilson, University of Alberta, Standpoint Eugenics. Brown-bag lunch co-sponsored with the Dept. of Educational Policy Studies. Noon-1:30pm, 7-102 Education North. Thursday Oct 17 – Eugenics and Indigenous Perspectives. Discussion panel co-sponsored with the Faculty of Native Studies. Panelists: Tracy Bear, Joanne Faulkner, Jerry Kachur, Noon-1:00pm, 2-06 Pembina Hall. 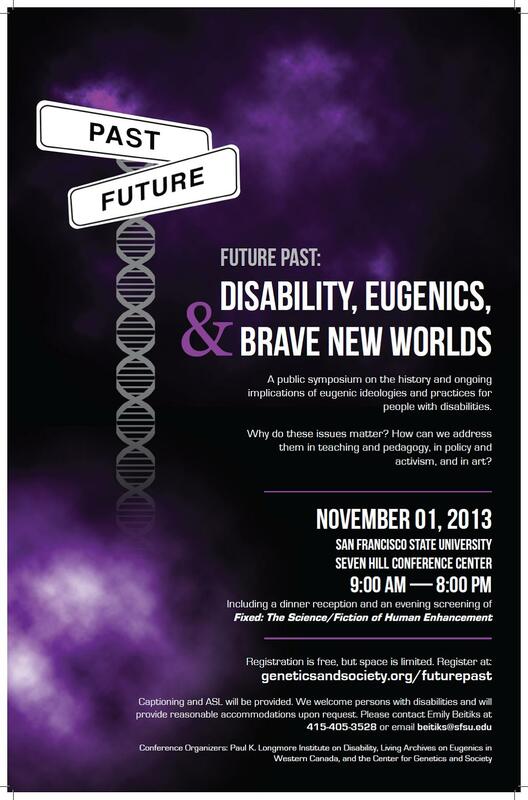 Friday Oct 18 – 1) Persons’ Day Panel: Feminism, Motherhood and Eugenics: Historical Perspectives. Panelists: Wendy Kline, University of Cincinnati, Erika Dyck, University of Saskatchewan, and Molly Ladd-Taylor, York University. Noon – 1:00 pm, Henderson Hall, Rutherford South. Wheelchair accessible. 2) Wendy Kline, University of Cincinnati, “The Little Manual that Started a Revolution: How Midwifery Became a Hippie Practice”, 3:30 – 5.00pm, Assiniboia 2-02A, co-sponsored with the Departments of History and Classics, and Women’s and Gender Studies. 3) FIXED: The Science/Fiction of Human Enhancement. A documentary by Regan Brashear www.fixedthemovie.com, co-sponsored with the Faculty of Rehabilitation Medicine and the John Dossetor Health Ethics Centre. Telus Centre 150. Doors at 6:30 pm, film at 7:00 pm. Q&A with Dr. Gregor Wolbring (who is featured in the film) following the film. Wheelchair accessible and closed captioned. Saturday Oct 19 – Team Meeting, Living Archives on Eugenics in Western Canada. 2-02A Assiniboia Hall (9:00 am – 4:30 pm) Lunch provided; please RSVP to moyra@ualberta.ca by Noon Oct 16th. Monday Oct 21 – 1) Joanne Faulkner, University of New South Wales, The Politics of Childhood and Community Identity. Noon – 1:00 pm in 7-152 Education North. Co-sponsored by the Departments of Educational Policy Studies and Human Ecology. 2) World Premiere “Surviving Eugenics in the 21st Century: Our Stories Told” 7:00 pm – 9:15 pm Metro Cinema at the Garneau, 8712 – 109 Street NW, Edmonton. Trailer: http://youtu.be/QoM12GAJm8I; closed captioned and ASL interpretation; wheelchair access through the alley entrance. Please sign up in advance at Facebook to help us with numbers! Tuesday Oct 22 – 1) Joanne Faulkner, University of New South Wales, The Coming Postcolonial Community: Political Ontology of Aboriginal Childhood in Bringing Them Home. 4.00 – 5.30pm in Assiniboia 2-02a. Co-sponsored with the Departments of Philosophy and Sociology. 2) Difference and Diversity: An Evening of Performances. Featuring CRIPSiE (formerly iDance), a reading by Leilani Muir, the art work of Nick Supina III, and much more. Education North 4-104. Doors at 6:30 pm, performances at 7:00 pm. Please sign up in advance via Facebook to help us with numbers! ASL Interpretation can be arranged for events, please contact moyra@ualberta.ca prior to the event. All events are at the University of Alberta, Edmonton. How do technologies that claim they will change our bodies and minds challenge our views of disability and normalcy? How might this affect what it means to be human in the twenty-first century? These are the questions tackled in FIXED: The Science/Fiction of Human Enhancement. It’s a haunting, subtle, urgent documentary that takes a close look at the drive to be “better than human” and the radical technological innovations that some are advocating we embrace. Producer/director Regan Brashear has working on labor, race, youth, LGBTQ, and disability issues for over twenty years through documentary film, union organizing, community forums, and grassroots activism. She is co-founder of Making Change Media, which produces videos for non-profits and labor unions, as well as independent long-form documentaries such as FIXED. Regan will be interviewed by Gina Maranto, Director of Ecosystem Science and Policy at the University of Miami’s Leonard and Jayne Abess Center, and author of Quest for Perfection: The Drive to Breed Better Human Beings. Please join us on Thursday October 3 at 11 am PT/ Noon MST / 2 pm ET for Talking Biopolitics a live web-based interview and conversation with Regan Brashnear, Gina Maranto, and you. The Living Archives on Eugenics in Western Canada is hosting the Alberta Premiere of FIXED: The Science/Fiction of Human Enhancement with co-sponsors the Faculty of Rehabilitation Medicine and the John Dossetor Health Ethics Centre, University of Alberta, on Friday October 18, 2013 at the Telus Centre 150, University of Alberta. Doors at 6:30 pm, film at 7:00 pm. Dr. Gregor Wolbring will join us after the film for questions and answers via SKYPE. Admission is FREE and this event is open to the public! Plan to attend! This year Alberta Eugenics Awareness Week (AEAW) will take place October 16 through October 22, 2013. Our bi-annual Team Meeting will be held at the University of Alberta in Assiniboia Hall 2-02A (our regular room) on Saturday October 19th from 9:00 – 4:30 (time will be confirmed closer to the date). Please save the date and plan to attend. We will also be holding an event on Friday October 18th to mark Person’s Day. Living Archives Team Member Dr. Joanne Faulkner from the University of New South Wales will be giving a talk along with other team members. We are currently planning other events and talks with the Faculty of Native Studies and the Department of History at the University of Alberta throughout the week. Location and time will be announced shortly!! On Monday October 21, 2013 we will be presenting the premier of our interview videos in a short film presentation called: “Surviving Eugenics in the 21st Century: Our Stories Told” . This will be held at Metro Cinema 8712 109 St, Edmonton. More details will be forth coming. On Tuesday October 22, 2013 we will be holding An Evening of Performances (still working on the title) at the Arts-based Research Studio (4-104, Education North). CRIPSiE (formerly iDance) will be performing and Leilani Muir will be reading from her book. We have several artists that will be performing – one team member will be showing us her skills with hula hoops (yes that’s correct hula hoops!). Rumor has it that a Belly Troupe made of up of all ages, sizes and abilities will be performing, but you will have to attend to find out if this is only a rumor. We have other performers who have expressed interest but are not finalized yet so more details will be announced soon. All events are FREE and OPEN to the PUBLIC. Save the dates and plan to attend! Bring your friends and families and spread the word. Posters will be distributed soon! Special Issue of the International Journal of Disability, Community & Rehabilitation (IJDCR) with the theme What Sorts of People Should There Be? Edited by Gregor Wolbring, Associate Professor Community, Rehabilitation and Disability Studies, Department of Community Health Sciences, Faculty of Medicine, University of Calgary, Canada is now available. The unfortunate truth is that discredited ideas never do die, they just rise again in slightly altered forms—witness eugenics. Despite the horrors perpetuated in its name, including forced sterilization and the Holocaust, the eugenic impulse is with us still. One of the forms it takes is schemes for “improving” offspring through the selection and manipulation of embryos. In the last year or so, one neo-eugenic advocate in particular has been garnering media attention. He’s Julian Savulescu, holder of an array of titles, including an endowed chair and directorship of a center at the University of Oxford funded by the Uehiro Foundation on Ethics and Education.